In 2002, an organization known as Capital Area Shiloh Shepherd Association took it upon themselves to apply a concentrated effort toward achieving recognition with the American Herding Breed Association. 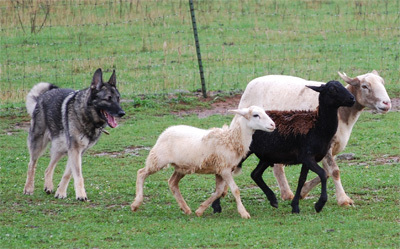 The final qualifications required by AHBA called for five or more Shiloh Shepherds to obtain Junior Herding Dog Titles, or better, within a specified two year time frame. Marti Nottingham carefully selected her first Shiloh puppy in '99, a smooth coat she calls Tuck. She purchased him as a companion from reputable breeder, Chary Pack of Hilltop Shilohs. Tuck's litter was sired by one of the great smooths of all time - Ch Hilltop's Triton King of Zion and his dam was Hilltop-Oasis Zoey Of Lobo. Marti had a strong desire to see our dogs to live up to their heritage as a herding breed. She took an active role right from the beginning. Even during the first days of evaluation, Tuck displayed obvious herding instincts. Together, they devoted many hours to the challenge of training and became the very first team to earn their HCT and JHD titles in the mission for AHBA recognition! When asked what she liked best about training for the HCT and the JHD, Marti quickly answered, "That would have to be that it really got Tuck's interest! He loves herding! Tuck is the smartest dog I have ever owned - I have tried Obedience, Agility, Schutzhund and Tracking with him and he will do what is required, but he is not having fun. He didn't have the energy like he does when he is herding. I can say 'woolies' while we are at home and he runs to the door and is all excited! I also liked the camaraderie that we shared while training with fellow Shiloh owners, and the fun that each herding practice brought." Marti and Tuck continue their education at Keepstone Farm in Berryville, VA and are currently preparing for AHBA Trials in 2006.